If you have an interest in learning the “other side” of the Tischendorf-Sinaiticus matter, I suggest you read the English article from The Art Newspaper here. What follows below is the comment left by Alexander Schick yesterday. I found it in my spam this morning and have marked it as approved. So far it has not shown up among the comments. I wanted to share this info with our readers, so I have elevated it to a blog entry. I knew there was controversy over the matter. Schick’s mother tongue is German. I have corrected spelling of a few words, but otherwise left the comment as I received it. In my post of yesterday I was telling about the letter posted at Saint Catherine’s. Here is the “other side” of the story. Our thanks to Schick for this information. Your comment about Tischendorf”s letter at St. Catherine monastery. The letter and the explanation of the monks must be seen in a total new light! Worth to study! Everyone can now see, that Tischendorf was an honorable man and not a thief! The photo below is from a slide I made at the British Museum in 1976. It shows Codex Sinaiticus and Codex Alexandrinus in a display case at the Museum. The manuscripts are now in the new British Library near the King’s Cross tube station. 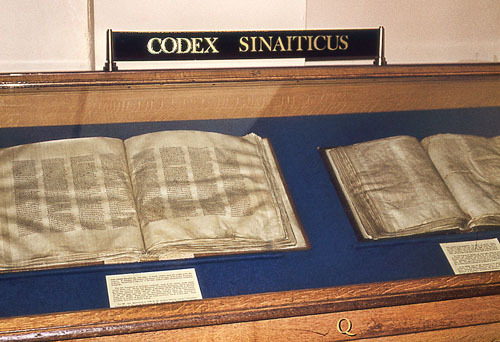 Codex Sinaiticus (left) and Codex Alexandrinus (right) displayed in the British Museum in 1976. Photo by Ferrell Jenkins. This entry was posted in Bible Places, Bible Study, Old Testament, Travel and tagged Biblical Manuscripts, Textual Criticism. Bookmark the permalink.